Teen girls have so much going on that it’s hard to make time for health. But to be happy and successful in all areas of life, it’s important to take care of themselves. In A Girl’s Guide to Fitting in Fitness, authors Erin Whitehead and Jennipher Walters show girls the changes they can make to be more active. Fitness begins with healthy eating, and proper diet is presented, with an understanding that we all occasionally indulge in foods that aren’t good for us. But since teen girls are also prone to anorexia and bulimia, this book also shares the signs of an unhealthy eating obsession. Developing a fitness routine is encouraged, and sample fun workouts are included. We all know it’s harder to stick with a program when real life interferes, and tips are provided on how to succeed at school, on weekends and during the summer. Today’s teen girls are busier than ever, so it takes some planning to fit healthy habits into their schedules. 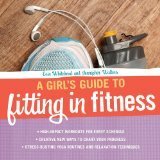 Speaking in their language, A Girl’s Guide to Fitting in Fitness is perfectly suited to their needs as they learn to take better care of themselves.